Air Chief Marshal Sir Stuart Peach said the UK economy would be "immediately and potentially catastrophically" hit if one of the many undersea cables linking Britain to the rest of the world were disrupted. The cables, which lie on the ocean floor, ensure communications flow freely to and from the UK. Sir Stuart pointed the finger directly at Moscow, claiming they were probably plotting to damage the undersea cables. "Russia's Navy could cut UK's undersea internet cables"
​Steffan Watkins, a Canadian-based open-source intelligence analyst who monitors military naval movements, said undersea cables were the backbone of the worldwide telecom infrastructure and there were also unmarked military communications cables. "Sabotage of the world's undersea telecom infrastructure is not a threat specific to Russia, yet it is being treated as such in the Western media, due to statements leaked by anonymous Pentagon officials in 2015. There has been no evidence provided by any government or non-government agency that shows Russia is planning on cutting any cables, other than anonymous Pentagon officials leaking those accusations to the media, conveniently right before requesting more money, from the Senate Armed Services Committee," Mr. Watkins told Sputnik. 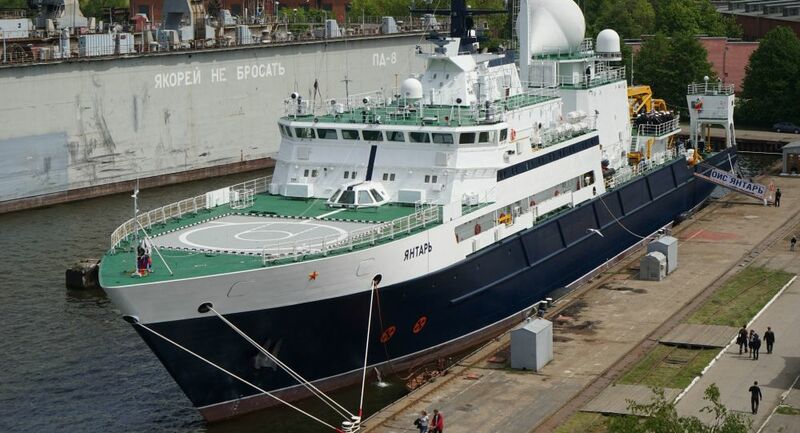 Russia launched the oceanographic vessel, Yantar, in 2015 and it has been surveying large areas of the world's seas. "I have reviewed the majority of Yantar's path at sea since she was commissioned, and it seems like the Russian Navy is surveying the bottom of the ocean, along shipping lanes, and other locations that are important to them, and their allies. They have stopped over areas believed to have Syrian telecom cables, and after they were done, emergency repairs were needed by the Syrian authorities. Did the Yantar expose a tap that had been placed on Syrian telecom cables by another state?" Mr. Watkins told Sputnik. ​"Yantar also positioned itself in the Persian Gulf near Iran, near the location of a cable thought to have an outage before they got there. Did they show up to repair it, or assess the damage to the cable? Was the cable damaged as part of another nations' covert operations? The Yantar's operations are secret but their movements frequently are not and can be tracked using commercial AIS transponder methods; without evidence from The Pentagon showing some proof of tapping/cutting plans, it's just more conjecture and fake news," he told Sputnik. "It is the job of the military to anticipate all threats, no matter how minor, before a conflict occurs, and hopefully avoid that conflict. Maybe someone figured out this was a potential threat, and explored how much of a threat it could be. The US Navy has good reason to think the Russian Navy could destroy the world's cable infrastructure, because it could. However, there is a difference between what is possible, and probable. Russia, and every country in the world participating in our global economy, rely on these cables. The US military, or any military, could destroy telecom cables too. I'm much more concerned with terrorism, and cable landing sites are extremely vulnerable to terrorist attack, since such an attack could happen today or tomorrow. The threat of a Russian military operation cutting the worlds' communication lines is not something that keeps me up at night," Mr. Watkins told Sputnik. ​"In the initial leak by the Pentagon in 2015 they mentioned the Russians were looking for military secret cable networks. Those networks would be fair military targets in a time of conflict, and would disrupt American military operations globally, not the internet. I believe it is much more likely that the Pentagon wants to get the world worried about the Russians cutting their internet, because it's easier to explain than their own vulnerable networks," he told Sputnik. "It's much more likely the Russian Navy in a conflict would want all the cables mapped out so they knew which cables to cut to cripple American military communications networks. I believe the Pentagon is much more concerned with their own mesh of secret and uncharted cables that criss-cross the oceans of the world. Public commercial cable networks are already mapped and that information is readily available in the industry; the Russians don't need to survey them, they can just read a nautical chart," Mr. Watkins told Sputnik. In a report for center-right UK think tank Policy Exchange, Conservative MP Rishi Sunak said an attack on the UK's undersea communications cables could deal a "crippling blow" to Britain's security and economy. UK defence chief says threat that Russia could sever undersea cables and cut off internet could cause chaos in Britain. But on the upside, it will increase productivity. ​"It is not satellites in the sky, but pipes on the ocean floor that form the backbone of the world's economy," said Admiral James Stavridis, a former US Navy officer and NATO supreme allied commander, who wrote the foreword to the report. Adm. Stavridis claimed China, Iran and Russia all posed a threat to the cables. The views and opinions expressed by Steffan Watkins are those of the expert and do not necessarily reflect those of Sputnik.